Does It Rain in Space? 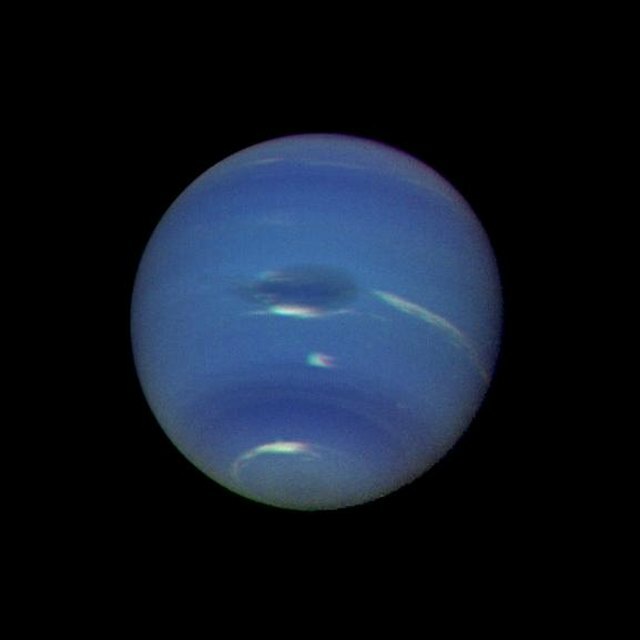 What Is the Weather on Other Planets? Does It Rain on Pluto? 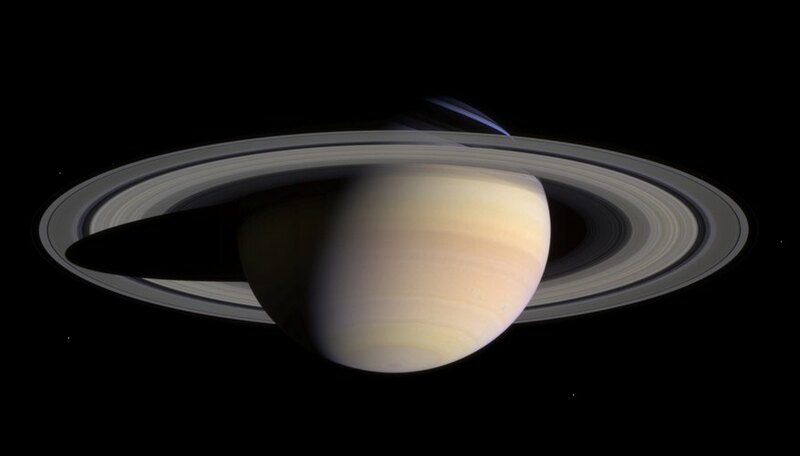 Saturn is the second largest planet in the solar system, orbiting approximately 900 million miles from the sun. A day on Saturn is 10 hours long, but one of its years extends over 29 Earth years. Saturn is a gas giant, composed mainly of hydrogen with trace amounts of helium, methane, water and ammonia. The planet is not dense and, in fact, would float on water. Saturn's magnificent rings are composed of water ice, rocks and dust. They also have a surprising effect on Saturn's weather. The temperature at the top of Saturn's clouds hovers around –400 degrees F. This temperature is cold enough to freeze ammonia, which condenses and falls into the warmer lower atmosphere, where it remelts. Saturn's solid core probably contains nickel, iron, rock and metallic hydrogen. The interior is very hot because of its high gravitational pressure, reaching temperatures above 21,000 degrees F. Scientists have estimated the overall average temperature of the planet at –285 degrees F. Satellites have clocked wind speeds on Saturn in excess of 1,000 miles per hour. Saturn has huge electrical storms extending over thousands of miles. Lightning bolts on Saturn are 10,000 times stronger than those on Earth. Saturn's lightning creates radio waves known as Saturn electrostatic discharges. Long-lived storms, called white spots, can last months or years. Saturn's north pole is the site of a permanent hurricane with an eye more than 1,200 miles wide and outer wind speeds of around 330 miles per hour. Storms are observed elsewhere on the planet, including the equator, where the Great White Spot reappears approximately every 30 Earth years. In 2013, the Keck II telescope in Hawaii detected water ice precipitating from Saturn's rings and falling into the planet's ionosphere. These water droplets are electrically charged and paint dark stripes in the planet's upper atmosphere. The stripes run parallel to Saturn's equator and are magnetically linked to Saturn's brightest rings. The light-colored spaces between the stripes correspond to gaps separating Saturn's rings. Scientists estimate that ring-generated rain dumps up to 10 Olympic-sized swimming pools worth of water on Saturn's atmosphere each day. This rain may contribute to the higher-than-expected temperatures in Saturn's ionosphere. Scientists in 2013 used new data to demonstrate how Saturn, along with Jupiter and perhaps Uranus and Neptune, can experience a rainfall composed of diamonds. Intense electrical storms can dissociate organic molecules such as methane, freeing up pure carbon that then falls towards the planet's surface. At lower altitudes, the atmospheric pressure is great enough to convert the carbon atoms into graphite and then into their diamond form. Eventually, the pressure and temperature build to the point that they melt the diamonds. Up to 1,000 tons of diamonds arising from lightning strikes fall in Saturn's atmosphere each Earth year. Bank,, Eric. "Weather Facts About Saturn." Sciencing, https://sciencing.com/weather-saturn-8582383.html. 25 April 2017. What Is Saturn's Core Made of?